As the government continues its negotiations over Brexit – both with the European Union and the UK parliament – the possibility of the UK participating in the forthcoming European Parliament elections is becoming more and more likely. In light of this, regional Green Parties have begun the process of selecting candidates to fight those elections. Principle is what sets us apart from the run-of-the-mill politicians and their parties. We stand because we have next to no choice for the good of the planet, future generations and other species. It’s easy to see others corrupted by power – whether today’s Prime Minister clinging on despite her incompetence over Brexit, or the MPs’ expenses scandal of a decade ago. For Greens though, politics is a vocation not a career. It’s almost as if we can’t switch off our in-built agitation to combat everyday injustice – from the exploitation of the migrant worker to the double injustice of those least responsible for climate change being made to most suffer their consequences, such as in low-lying coastal areas. I joined the Greens over sixteen years ago, shortly after a stint as a researcher in the European Parliament. Working on environmental risk assessment, with reference to GMOs and endocrine disrupting chemicals, I could see how well Green MEPs operated, too. It is our principles and values that allow us to shine and to punch above our weight. As a founding signatory of Extinction Rebellion and participant of Occupy movements, I believe our politics also comes with a mission – not just to reform but to transform and serve. We work proactively alongside campaign groups both within democratic chambers and outside them to educate ourselves and others in the step changes needed to fix our broken society (increasing xenophobia), broken economics and broken future. Our highest priority isn’t Brexit as such, important though that is; but the climate change emergency. Politicians could go on another two years, just as they’ve condemned one meaningful vote then the next to the dustbin of history. As surely as the Commons was practically empty for a climate change debate, we can’t continue to ignore the school generation who, taking inspiration from Greta Thunberg, is voting with their feet. I’d like to see the EU Emissions Trading scheme – currently a half-baked instrument for capitalising carbon emissions – reformed from ‘cap and trade’ to contraction and convergence principles. Let’s use every EU mechanism at our disposal – repurposed and re-engineered to maximum effect. I’ve heard it said that we don’t do personality politics. This is only half right. It’s true that we don’t elevate the veneer of personality above politics as such. But is it the case that Greens lack personality as a result? Far from. 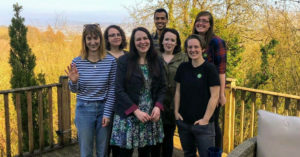 Greens have terrific personality – we’re objective about life-chances, take responsibility for people having to live without basic needs, and speak out with passion and verve on the mistreatment of animals. I believe in a Party where every member feels equally invested in our political future – through governance, policy-making and campaigning. I witnessed, in the early hours alongside Jean, the 2016 Referendum count at the Guildhall and was left devastated by the debilitating effect it was likely to have upon national politics – losing us the prospect of three or more future MEPs. Fast forward to today and not many would have predicted such a bungled attempt by a PM to broker a deal. With everything to play for, we cannot defend a People’s vote on democratic grounds alone. Let’s make additional effort to win over those who voted Leave and still want to see that outcome at all costs. Our job is to take on the difficult debate of explaining how an original result should risk being overturned – with the requisite humility not to patronise those who voted differently as being ill-educated or duped. 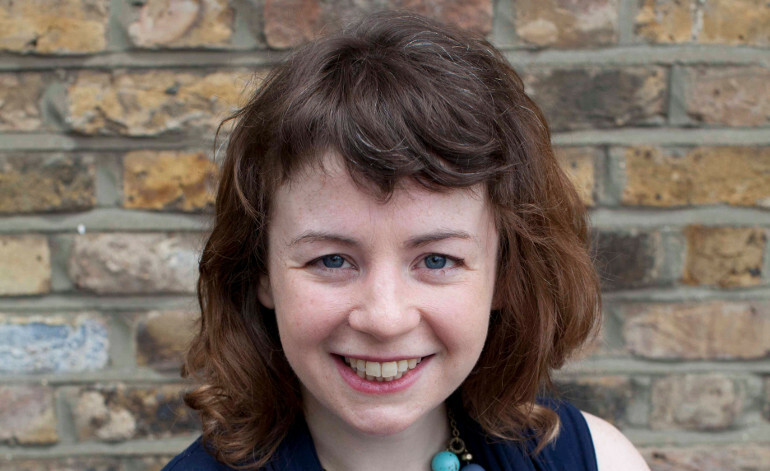 As a lifelong Londoner and having campaigned hard in three previous EP elections (2004, 2009, 2014), I’ve demonstrated the commitment to Green politics to enable us to hit the ground running in a short MEP campaign. I’d seek to bring to the campaign the same energy and political nous as would need to be in evidence in your Green MEPs of the future – and it would be an honour to serve as one. You can read more about my priorities and experience on Facebook, Twitter and my website. 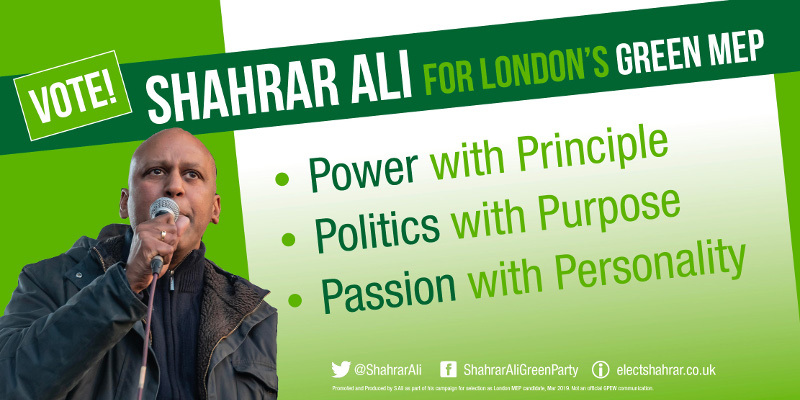 Shahrar Ali was Deputy Leader of the Green Party of England and Wales from 2014-2016. Upon his election, he became the first BAME Deputy Leader of a parliamentary political party in the UK. He was unsuccessful in his re-election bid in 2016. 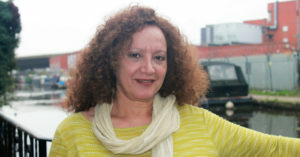 Ali stood for the leadership of the party in 2018, coming second to Sian Berry and Jonathan Bartley. In 2015 published the book ‘Why Vote Green’, and earlier this year was selected as the 6th candidate on the Greens’ London Assembly list. All articles from those seeking to be Green candidates for London in the European Parliament elections can be found here.